Why Can’t Americans Ditch Checks? The first time Amelia Howells ever wrote a check, she was 28 years old and standing in a Connecticut apartment leasing office, with no idea what to do. The British expat had just moved to the U.S.; she’d never had to write a check in London or during her seven years in Switzerland. In an era of smartphones, online banking, and Venmo transfers, the U.S. still can’t seem to wean itself off paper checks. In most countries, they’ve gone the way of the fax machine and the rotary telephone. But their demise isn’t coming to America any time soon. 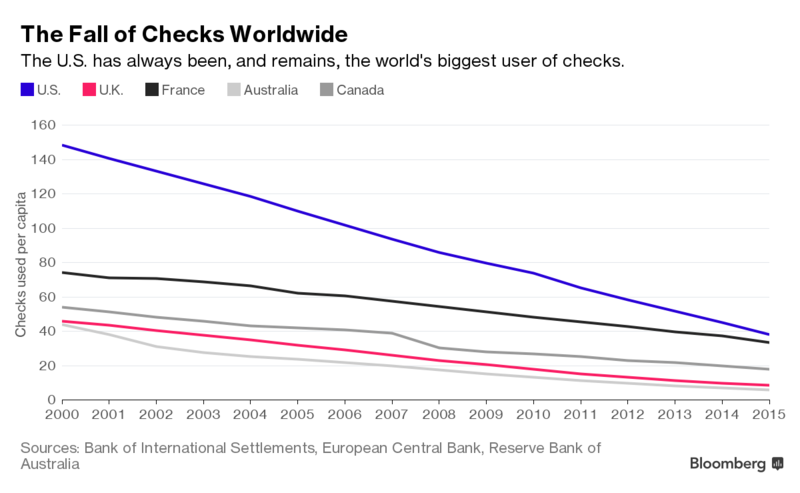 Americans still reach for their checkbooks more than anybody else. In 2015, they each made 38 check transactions, on average, according to data from the Bank of International Settlements, the coordinating body for the world’s central banks. Compare that with about 18 in Canada, just 8 in the U.K., and almost zero in Germany. The only country with anywhere close to American numbers is France. There are, of course, cheaper, faster, and more efficient alternatives. Electronic transactions clear quickly—no stamp or envelope needed—and cost their users about a 10th as much as checks to process. (A 2015 survey of businesses by the Association for Financial Professionals pegged the median cost of issuing a check at $3, compared with under 30 cents for a electronic transaction.) That’s not even taking into consideration that box of replacement personal checks, which can cost a consumer more than $20. Using peer-to-peer payment apps to transfer money between checking accounts, however, doesn’t incur fees. 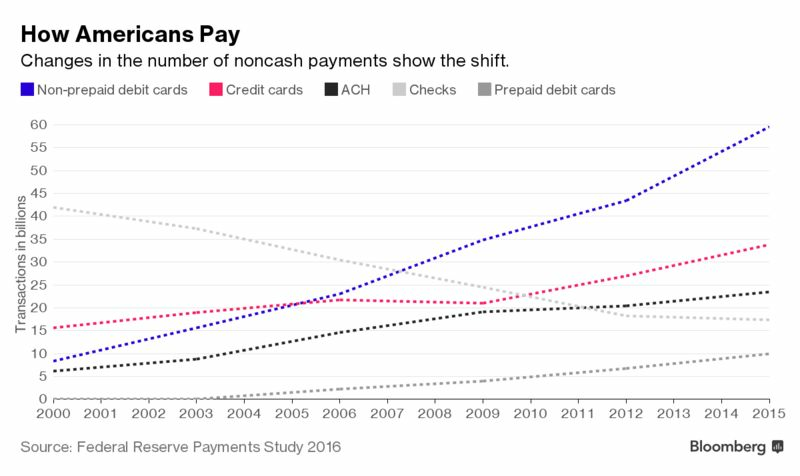 Checks have been in decline in the U.S. since the mid-1990s, but up until a decade ago, they remained Americans’ favorite method of payment other than cash. And although electronic payments, debit cards, and credit cards are more popular these days, the rate of checks’ decline has slowed, according to a Federal Reserve payment study from last year. In part, blame Americans’ comfort with them, and the fact they serve the underserved. Feedback from retailers suggests many older and rural Americans still use checks to pay for groceries and gas, says Tom Hunt, the director of treasury services for the Association for Financial Professionals. Particularly reliant on checks are the 33.5 million households that either don’t have bank accounts or supplement them with alternative financial services such as check-cashing and pawnshop loans. Far more of those households than fully banked households were paid by paper check, a 2015 survey by the FDIC found. Banks are trying to push consumers toward cheaper, faster mobile banking and peer-to-peer services like Venmo and PayPal, but older Americans still aren’t totally sold. A 2015 Fed survey found just 18 percent of smartphone users age 60 and older had ever used mobile banking, up from 5 percent in 2011. And a more recent Bank of America report found that while 62 percent of millennials used peer-to-peer services, only 20 percent of baby boomers and 10 percent of seniors did. Still, 71 percent of the survey respondents believed children under 10 will never have to learn how to write a check. Old habits die especially hard in the business world, where more than half of business-to-business payments are still made by check, according to an AFP survey from last year. The survey found the number of B2B check payments has risen slightly since 2013. “There are better, faster, more convenient, less costly payment methodologies in place, but with those comes the technology-adoption hurdle that a lot of companies just can’t get over,” said Hunt. Then there’s the highly fragmented American banking system—there are more than 10,000 depository institutions, making it a challenge to implement changes across them all—and a central bank that doesn’t have the regulatory power to phase out checks. The Fed can’t mandate a change to how the U.S. uses payment systems. Attempts are being made in the U.S. to modernize the system, but a faster-payments task force the Fed convened in 2015 to investigate how to bring the U.S. banking system in line with the rest of the world has acknowledged formidable hurdles. “Given the breadth and complexity of the U.S. market,” it said in the first installment of its final report, “it is more challenging to implement improvements to the payments infrastructure in a coordinated way.” Last week, it released the second half of that report, setting a goal of implementing platforms to deliver real-time, secure electronic payments everywhere by 2020. That technology already exists—but as the report notes, unlike in other countries, any changes in the U.S. will be market-driven. And they’ll be a long time coming. Americans haven’t seen any major improvements to checking since a 2003 federal law known as Check 21 first allowed banks to process checks electronically, without having to handle the actual paper checks. These days, practically no paper checks go through the banking system anymore, clearing times have come down to about a day—similar to electronic payments—and you can deposit checks from your phone.